SHOT Show 2019: What's New for Airsoft? This entire week we’ve been sharing some of the latest Airsoft News coming from SHOT Show, well this is a compilation post of all the news that we’ve seen coming out of SHOT that affects airsofters. Firstly, if you’ve not heard of SHOT. It’s a Annual Trade Show (business/media only) based around Shooting, Hunting and Outdoor Activities. It’s the largest gun show in the WORLD, bringing in more than 60,000 people through the Sands Expo Centre in Las Vegas, Nevada. During the show, traders use this time to meet account managers, make new business contacts, order products and get an idea of the latest products that should be released through 2019. With that said, you should definitely go check out all the videos below, who I’ve credited for the information throughout the event. G&G had a fantastic 2018 with the release of the ARP9/556 and this year seems to be a huge one for them. Starting with the pistols, we’ve got the GTP9 pistol becoming more available in additional colours, something that’s been very requested. If you don’t know about the pistol, it’s a striker-fired design that’s unique in the way it has an adjustable hop unit from within the barrel. That’s right, no more top slide removal! Beyond that it’s Green Gas powered, the magazines holding 22 rounds and comes in around 320FPS. Next up is their new branch of pistols under the PIRANHA series..
Again like the GTP9, it has the same barrel hop up adjustment, and will be available in 2 colours. What’s unique about this pistol, only half the top slide moves – meaning greater gas efficiency and more accuracy since the barrel has zero movement. It only uses the lower receiver and should be available very shortly along with extended magazines or go all-in with a GBB drum mag! Talking Small machine guns, the ARP9 has done amazing through 2018 but they wanted to provide a little bit more colour, so from 2019 you can buy in 5 more colours – red, blue, green, white. If you’ve already got an ARP9 you can also buy the parts in kits to swap out yourselves. If you’re bored of ‘another M4’, but want something as small as the ARP9 then look no further at the PRK9 or the PRK RTS. These are the 9mm versions of the AK in a body that’s the same size as an ARP9. The RTS version stands for Retractable Stock, giving you the option of folding it out on longer engagements. Both these models come with the newer ETU and Mosfet, which means you’ll have battery warnings when low. In addition to that, you will now see for the first time on a V3 Gearbox – a rotary hop unit. Perhaps this will solve the AK issue of moving hop unit sliders over extended use. Very exciting! Another thing I’d like to point out at G&G is the newly licenced Cobalt Kinetics BAMF rifle. This is a competition shooter in real steel that’s now available for airsoft. With a skeletonized receiver, this rifle is fully ambidextrous with an amazing amount of details all over. Sure, the looks aren’t for the military focused players, but if you want to look great while shooting – this is the rifle for you. To go along with this rifle, they’ve designed a new style of M4 Magazine known as the ADAM. Auto Drop Advanced Magazines, this means upon empty, the magazine will now automatically fall from the magwell ready for a new magazine to be entered. Is this viable for airsoft? Well, you can disable the feature as it’s really designed for speed shooting and competitions. It’s always good to see innovation coming from G&G and I can’t wait to give one a try. 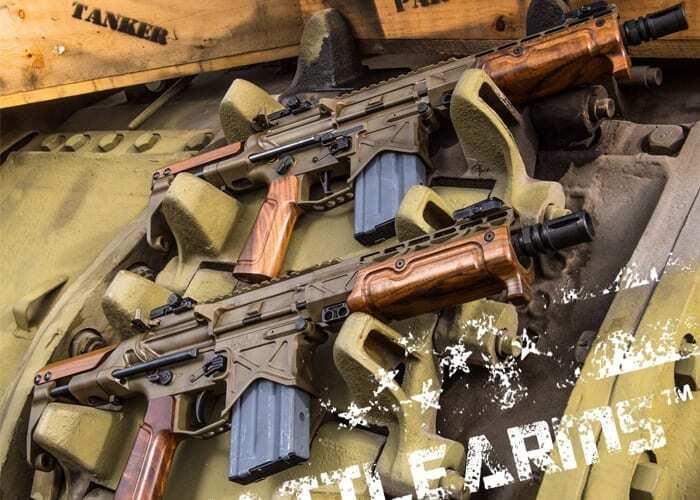 The big news from RedWolf is the announced BAD rifle or Battled Arms Development rifles – both the Tanker and Paratrooper models. These are licenced and feature a real wood handguard, M-LOK free floating rail and it’s entirely made custom to order. If you’ve not seen one of these rifles, they’re going to be a little bit like Marmite. Along with that, if you like custom builds. Well the RWA NIGHTHAWK CUSTOM Agent 1 has been released at Shot Show with only 100 sets available. 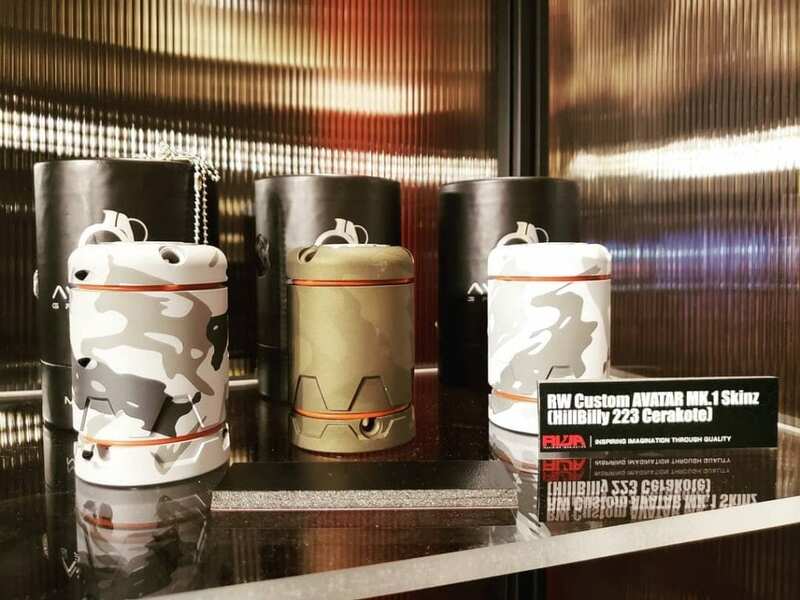 Finally, Red Wolf is now starting to venture heavily into cerakote designs and you’ll spot a lot more patterns custom made for you. Including the new Avatar cerakote skinz. Well this was announced just before SHOT, but Airsoft Innovations have released the MASTER MIKE. Teased as the little brother to the 40Mike, the Master is a smaller version, using 100 BBs being fired at 220 FPS. On top of that, and the main sticking point for the 40Mike, there is a lot more spread than before. We’re currently being informed that the Master Mike has a 10ft spread at 20ft with an effective range of 60ft. This is against the 40Mikes 10ft spread at 100ft. Technically, the grenade uses the patented Quantum Drive Technology and should fit in even more launchers than the 40Mike since it is shorter. There are 3 talking points this year coming from ASG. Firstly the CZ Shadow 2 is now being shown, although it’s not in production yet. The Shadow 2 comes in CO2 by standard and is based on the real steel version which again is more of a competition shooter. There is a newly designed upper slide, an adjustable magazine release paddle, adjustable trigger and a redesigned beaver tail that gives you a stronger grip by being deeper. Secondly, the Scorpion, ASGs flagship product is having another design tweak as the release the EVO TEK – Tactical Ergonomics Kit.Designed by ASG with the input of real firearms designers, this is a 3 piece kit which you can buy separately for 2018 Evos or straight out the box. The 3 parts are the futuristic styled Handguard (with M-Lok), Magazine Well and Front Grip. There are 2 variations of magazine well, dependant on whether the user has a mid or high cap magazine. and finally, the ICS/ASG collaboration with Hera Arms CQR is near launch! It’s now in production based on a rifle thats a few years old now. As we discussed last year, it uses HERA Arms furniture along with the split gearbox design from ICS. There are 2 different colour options and also 2 different models based upon which mosfet you would like. We haven’t heard a lot from Tippmann but I’ve been a big fan of their AEGs (Lonex OEM) through 2018. This year we’re finally being treated to an updated version of the HPA Tippmann. What’s changing? Well, firstly they’re removing the Delta Ring and changing the handguard to M-LOK. Secondly, the TDC mod which is seen as an essential upgrade is now part of the rifle as standard. And finally, the grip has been changed and given a more modern look. More Information coming soon from JAG Precision, Sig Sauer and more! Another update from SHOT Show 2019 with Foxtrot One7, Live from the Sands expo centre, Las Vegas.